Bryan Biggins is a gamer. Specifically, he’s a master of the Sovereign of Darkness video game, handily beating the Demon King over and over again. It’s the best part of his day; he’s middling at school, there are a handful of bullies who call him and his best friend Oz names, and he’s got a crush on a girl that he will pretty much never get. Why not spend all of your free time perfecting this game? Then, one day he breaks through to the secret level. He doesn’t think anything of it, until he can’t get up the next morning before feeding a coin in the slot that has magically appeared over his alarm clock. And that’s just the beginning: his life has become a video game, complete with hit points, experience points, quests, and leveling up. It’s confusing for Bryan at first, but eventually, he figures out (sort of) how to “play” the “game”. He finds himself making decisions that he wouldn’t have before. And maybe that’s a good thing. I’ve enjoyed Anderson’s books in the past, and this was no exception. It’s got a clever premise (a really great contemporary-fantasy blend) and Anderson has a great light, fun delivery with this. 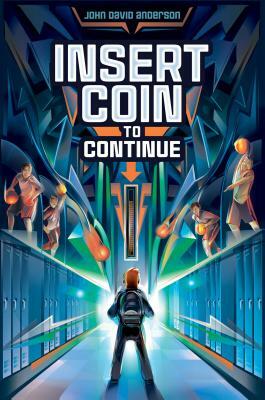 It captures the difficulty of being a 7th grader, of being someone who hasn’t quite got everything together yet, but the whole gaming element adds a level of fun that makes this one stand out. It was a unique premise, and a delightful book to read. Hooray for more fun John David Anderson!! !